In my experience libraries don’t always stamp these stickers though – some just scan the books and give you printed return dates or just let you check online when books are due. Which probably still doesn’t mean that this book has been read or the general situation is any less bleak. I wonder though: does that book have a summary on the back? Often what has kept me from checking out some books is that many editions – particularly anything hardcover – are just the book and nothing else (no blurb) and one just can’t tell if it would be of any interest or not (in particular if it’s a completely unknown item/author). I think the digital age might save some of these books – I would like to read this, but probably it’s not all that easy to get hold of (I imagine few libraries have it) but if one could just have an easily accessible online library… especially if that library directly linked to more information about the work/author or reviews! P.S. I’m done with exams & just have to enter marks and prepare to mail out the scripts. Once I’m done I’ll catch up on what I missed of your posts this month – so expect some more comments from me soonish! Great stuff. Congratulations on getting through the exam scripts – just in time to enjoy the warm weather. You’re right that libraries sometimes don’t stamp for taking books out, however this book was in such pristine condition that it was clear it had never been read before. The pages were as crisp as anything. There is a brief summary on the back and a more full description on the inside. Good point about hardcovers generally though. Maybe publishers need to think more carefully about this or maybe libraries should do more to signpost books that don’t have clear covers? And yes, I like your thinking on the digital library front. I agree with Alua – my library never stamps books anymore – everything is done electronically. I find that quite sad as I liked knowing how often books were taken out. Sorry to hear that so many books are being sold from the libraries – I do my best to check as many out as possible. Great to hear from you. 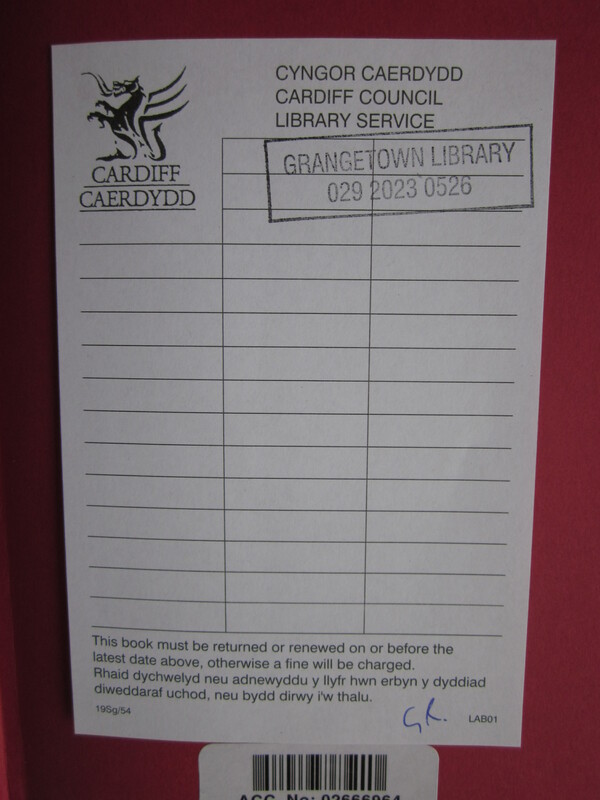 Yes, Cardiff Council has confirmed that their libraries scan rather than stamp, however the book was in such mint condition that I’d be surprised if it had ever been read. Right now my book club is reading the novel “cutting for stone” about an Ethiopian surgeon. I don’t know if this falls into your “rules” but I’m pretty sure the author is Indian and spent most of his life (early life?) in Ethiopia. It is REALLY good (probably my fave of the year so far) & I can’t wait to finish it! Still wanted to add something (I’m nearly done with my catch-up commenting, sorry! ): not knowing anything about Equatorial Guinea I read through this post and then I got to the end, when I realised I can read this in the original language! Do you know what the Spanish title of the work is? I would actually love to see original titles included in your posts, both to make the fact that we are dealing with translations more visible (the infamous issue of the “translator’s invisibility”) as well as for readers that can and want to read the originals to be able to find them more easily. Great stuff, thanks. The original title is ‘Las tinieblas de tu memoria negra’. Nice suggestion about the original titles. I will try to include them where I can.